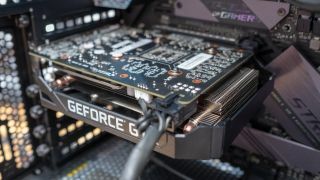 Nvidia has released a new set of drivers that allow owners of GTX graphics cards to enjoy ray tracing with games that support these added visual bells and whistles. Indeed, the new 425.31 GeForce Game Ready Drivers support ray tracing via DirectX Raytracing (DXR) on the GeForce GTX 1660 Ti and GTX 1660, along with the GTX 1080 Ti, GTX 1080, GTX 1070 Ti, GTX 1070, and GTX 1060 (6GB). The Titan X and Titan Xp are also supported. Which GeForce GTX 1660 Ti is best for your PC? Naturally, you have to bear in mind that the performance hit on GTX cards may be a tough blow to take, given that they don’t have the fancy on-board tech and dedicated RT cores that really help with rendering scenes with ray tracing (which is an intensive task even for an RTX GPU, after all). When it first revealed this capability was coming to GTX graphics cards, Nvidia made it clear that we should only expect basic ray tracing effects and a low ray count, and that these GPUs wouldn’t be able to handle anything complex. And with the release of these new drivers, Nvidia has provided some handy benchmarks to give us an idea of the sort of ray tracing performance we can expect from GTX models. It’s no real surprise that Metro Exodus, a very taxing title, will only limp along to the tune of 16.4 frames per second (fps) on a GTX 1080 Ti at 1440p resolution with ray tracing set to ‘ultra’ details. Whereas with DLSS, the RTX 2080 Ti will hit a smooth 65.7 fps, and indeed the RTX 2080 manages 52.7fps. (DLSS helps to boost frame rates, as well as image quality, and isn't one of the additional benefits coming to the GTX GPUs). Shadow of the Tomb Raider, also at 1440p but with ‘high’ details, saw the GTX 1080 Ti rack up 34fps, which is at least just about palatable – but the RTX 2080 Ti hit 84fps, and the RTX 2080 achieved 64 fps (again, with the RTX models using DLSS). What about the GTX 1660 Ti? That managed 8.5fps in Metro Exodus and 24fps in Tomb Raider – the latter almost matching the GTX 1080’s 25fps – but overall, these figures will hardly bowl you over. However, remember that these benchmark tests were running ultra and high DXR, and as we already mentioned, Nvidia did tell us that we should only expect basic effects, ie low DXR. Oddly, though, Nvidia didn’t provide any benchmarks for low settings, but it did include results for Battlefield V running medium DXR. Here, at 1440p resolution, the GTX 1080 Ti hit a more impressive 50.6 fps, with the GTX 1660 Ti on 36.8fps, naturally considerably behind the RTX cards like the vanilla 2080 which managed 72.8 fps (with DLSS). Dropping down to Full HD with medium settings, the GTX 1080 Ti managed 64.1 fps, and the GTX 1080 recorded 53.1fps, with the GTX 1660 Ti not far behind that on 49.8fps. So dropping to low might get you something a little smoother on the more demanding ray tracing games. All in all, given the benchmarks shown, it feels a little like Nvidia is trying to stress the power of RTX cards here, as opposed to the ability for GTX cards to capably manage some kind of decent ray tracing performance. The new 425.31 drivers also provide optimizations for Anno 1800, and fixes for some game crashing bugs, including random crashes in ARK: Survival Evolved with GeForce RTX 20-series graphics cards. Will Intel's graphics cards support ray tracing straight off the bat?